The paper copy will be published mid March and then distributed to all houses by WNW. Spare copies available at Lakeside Fish & Chips. The next edition is May 2019. The paper copy will be published mid Feb and then distributed to all houses by WNW. Spare copies available at Lakeside Fish & Chips. The next edition is March 2019. The paper copy will be published mid Jan and then distributed to all houses by WNW. Spare copies available at Lakeside Fish & Chips. The next edition is February 2019. The paper copy will be published mid Dec and then distributed to all houses by WNW. Spare copies available at Lakeside Fish & Chips. The next edition is January 2019. The paper copy will be published mid Nov and then distributed to all houses by WNW. Spare copies available at Lakeside Fish & Chips. The next edition is December 2018. The paper copy will be published mid Oct and then distributed to all houses by WNW. Spare copies available at Lakeside Fish & Chips. The next edition is November 2018. The paper copy will be published mid Sept and then distributed to all houses by WNW. Spare copies available at Lakeside Fish & Chips. The next edition is October 2018. The paper copy will be published mid July and then distributed to all houses by WNW. Spare copies available at Lakeside Fish & Chips. The next edition is September 2018. The paper copy will be published mid June and then distributed to all houses by WNW. Spare copies available at Lakeside Fish & Chips. The next edition is July 2018. The paper copy will be published mid May and then distributed to all houses by WNW. Spare copies available at Lakeside Fish & Chips. The next edition is June 2018. The paper copy will be published mid March and then distributed to all houses by WNW. Spare copies available at Lakeside Fish & Chips. The next edition is May 2018. The paper copy will be published mid Feb and then distributed to all houses by WNW. Spare copies available at Lakeside Fish & Chips. The next edition is March 2018. The paper copy will be published mid Jan and then distributed to all houses by WNW. Spare copies available at Lakeside Fish & Chips. The next edition is February 2018. The paper copy will be published mid Dec and then distributed to all houses by WNW. Spare copies available at Lakeside Fish & Chips. The next edition is January 2017. The paper copy will be published mid Nov and then distributed to all houses by WNW. Spare copies available at Lakeside Fish & Chips. The next edition is December 2017. The paper copy will be published mid Oct and then distributed to all houses by WNW. Spare copies available at Lakeside Fish & Chips. The next edition is November 2017. The paper copy will be published mid Sept and then distributed to all houses by WNW. Spare copies available at Lakeside Fish & Chips. The next edition is October 2017. The paper copy will be published mid July and then distributed to all houses by WNW. Spare copies available at Lakeside Fish & Chips. The next edition is September 2017. The paper copy will be published mid June and then distributed to all houses by WNW. Spare copies available at Lakeside Fish & Chips. The next edition is July 2017. The paper copy will be published early May and then distributed to all houses by WNW. Spare copies available at Lakeside Fish & Chips. The next edition is June 2017. The paper copy will be published early April and then distributed to all houses by WNW. Spare copies available at Lakeside Fish & Chips. The next edition is May 2017. The paper copy will be published mid March and then distributed to all houses by WNW. Spare copies available at Lakeside Fish & Chips. The next edition is April 2017. The paper copy will be published mid February and then distributed to all houses by WNW. Spare copies available at Lakeside Fish & Chips. The next edition is March 2017. The paper copy will be published mid January and then distributed to all houses by WNW. Spare copies available at Lakeside Fish & Chips. The next edition is February 2017. The paper copy will be published mid December and then distributed to all houses by WNW. Spare copies available at Lakeside Fish & Chips. The next edition is January 2017. The paper copy will be published mid November and then distributed to all houses by WNW. Spare copies available at Lakeside Fish & Chips. The next edition is December 2016. The paper copy will be published mid October and then distributed to all houses by WNW. Spare copies available at Lakeside Fish & Chips. The next edition is November 2016. The paper copy will be published mid September and then distributed to all houses by WNW. Spare copies available at Lakeside Fish & Chips. The next edition is October 2016. The paper copy will be published mid July and then distributed to all houses by WNW. Spare copies available at Lakeside Fish & Chips. The next edition is September 2016. The paper copy will be published mid June and then distributed to all houses by WNW. Spare copies available at Lakeside Fish & Chips. The paper copy will be published on 11th May and then distributed to all houses by WNW. Spare copies available at Lakeside Fish & Chips. The paper copy will be published on 20th April and then distributed to all houses by WNW. Spare copies available at Lakeside Fish & Chips. The paper copy will be published on 9th March and then distributed to all houses by WNW. Spare copies available at Lakeside Fish & Chips. The paper copy will be published on 10th February and then distributed to all houses by WNW. Spare copies available at Lakeside Fish & Chips. The paper copy will be published on 13th January and then distributed to all houses by WNW. Spare copies available at Lakeside Fish & Chips. The paper copy will be published on 11th November and then distributed to all houses by WNW. Spare copies available at Lakeside Fish & Chips. The paper copy will be published on 14th October and then distributed to all houses by WNW. Spare copies available at Lakeside Fish & Chips. The paper copy will be published on 16th September and then distributed to all houses by WNW. Spare copies available at Lakeside Fish & Chips. The paper copy will be published on 15th July and then distributed to all houses by WNW. Since 2010 Wixams Neighbourhood Watch has delivered the monthly Wilstead Parish Newsletter to all homes in Wixams. This newsletter was produced by Wilstead Neighbourhood Watch. Since the new Wixams Parish commenced in May 2015, separate from Wilstead,a new Wixams Newsletter has been published every month by Wixams Neighbourhood Watch and delivered to all houses in Wixams Parish. The aim of the Wixams Newsletter is to help develop a safer local community and improve the quality of life. The Wixams Newsletter is the best way of telling people in Wixams about your services, events, and business - especially if you are a local business or organisation. As almost everyone is new to the village, in a new house, there is enthusiasm to do, go and spend! There are approximately 900 occupied new homes in Wixams, together with some established homes in Wixams, increasing to 1,000 later this year. We want to say 'thank you' to our advertisers. We only need a minimum of two A4 pages of advertising and it is on a first-come first-served basis. Since we began the advertising space has been fully subscribed. There is a waiting list. Priority given to 1) Wixams and Wilstead services, events, business adverts 2) repeat advertising and 3) advertising for 3 months. Editorial deadline is advertised in the current Wixams news edition. Payment is up front. receipted invoices will be emailed to advertisers. Note this is a community publication that is aiming to break even rather than make a big profit. Monthly advertising rates for Wixams/Wilstead and External. Please note that repeat advertising is fully subscribed, and because of local demand it is unlikely that there will be space for external advertisers. Small ads 60mm x 35mm cost £5 for two, invoiced in arrears, placed at editor discretion depending on space. Eg see page 2 October 2017. Community news is placed free of charge when space allows. 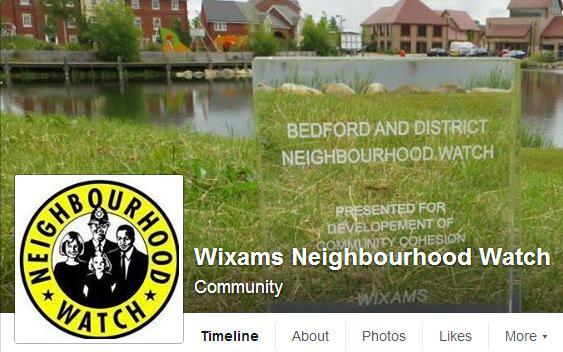 In 2014 Wixams Neighbourhood Watch was the winner of the National Neighbourhood Watch Award for Community Cohesion, a Bedford & District Neighbourhood Watch award and a Community Champions Award from BPHA. Wixams Neighbourhood Watch is grateful for the support it has received from BPHA.